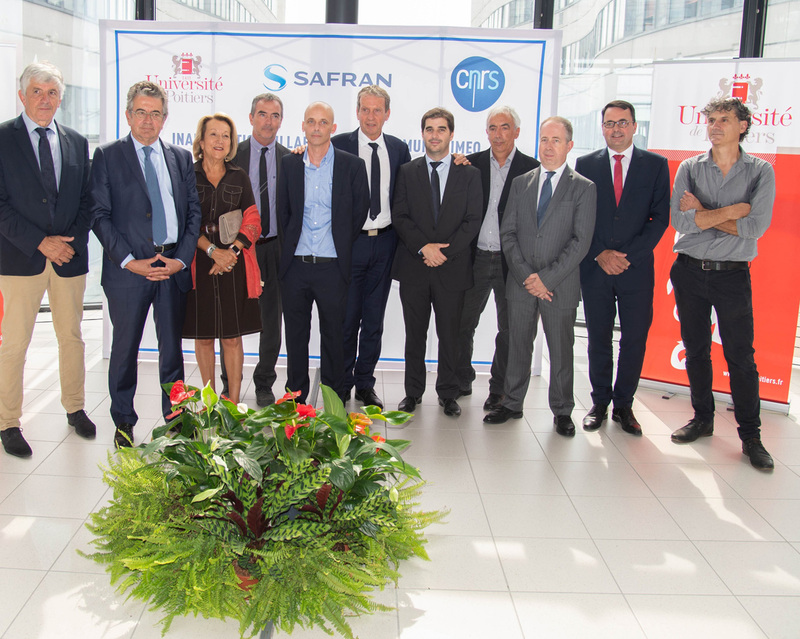 Safran Electronics & Defense Chief Executive Officer Martin Sion, CNRS Executive Officer for the development and University of Poitiers President Yves Jean inaugurated their joint lab, PRIMEO (for “Partnership for Research and Innovation in Emerging Materials for phOtonics”) in Poitiers on September 5th 2018. This inauguration took place in the presence of Nouvelle-Aquitaine region Vice-president Bernard Uthurry and President of Grand Poitiers Communauté Urbaine Alain Claeys. PRIMEO will conduct research on innovative materials and processes to apply deposits on optical components, which may in due course be used on cameras, binoculars, telescopes and other products to boost their performance and sharpen their competitive edge. The lab will be tasked with bringing fundamental research and possible industrial applications closer together, with a view to gaining agility and efficiency, and thereby building competitive advantages. This partnership will identify, optimize and fast-track possible transfers between fundamental research findings and expertise at Institut P’ on the one hand, and industrial applications on Safran Electronics & Defense products on the other. The goal is to give all partners the resources to grow strong together, become more competitive, and grow. Academic research will focus on studying innovative materials and researching new physical properties that may lead to step changes in technology and create differentiating value in civil and military products. The technology developments revolve around processes to deposit thin layers (in the single-digit nanometer range) on optical components (lenses, mirrors, etc.) to upgrade their performance and lower production costs. Work at PRIMEO labs will be funded equally by both partners and the team will comprise over a dozen people (researchers, engineers, PhD students and interns). They will also work on concrete projects and tender them at regional, national or European levels with a view to speeding up innovation, building skills and creating jobs in local academic and industrial circles. “Safran Electronics & Defense and Institut P’ have worked together on many early-stage technology developments in photonics and optronics, and filed several patents in the process, over the past eight-plus years. I am delighted with the realization of this partnership which marks a new phase and allows us to envisage major innovations in photonics,” said Safran Electronics & Defense Chief Executive Officer Martin Sion. “The partnership with Safran Electronics & Defense is old and strong. The creation of this new joint laboratory will strengthen the shared potential for research and innovation in the strategic field of materials and optronics," explained University of Poitiers President Yves Jean. “The CNRS believes strongly in these places of co-construction of innovation and mixing of two cultures that have sometimes ignored each other. Here it is not the case since it is another step on the way of an already longstanding and fruitful relationship between the academic world and Safran” added CNRS Executive Officer for valorization Michel Mortier. CNRS, the National Centre for Scientific Research is the main public research organization in France and in Europe with nearly 33,000 people and a budget of 3.3 billion euros (2014).